Background: Autoimmune hepatitis is a rare inflammatory disease of the liver that most frequently affects children and young adults. It is a multifactorial disease of unknown etiology, characteristically progressive in nature, and if left untreated, may lead to cirrhosis and terminal liver failure. It has been known for several decades now that immunosuppressive treatment convincingly alters the outcome of most patients with autoimmune hepatitis and as such it should be started as soon as diagnosis is made. 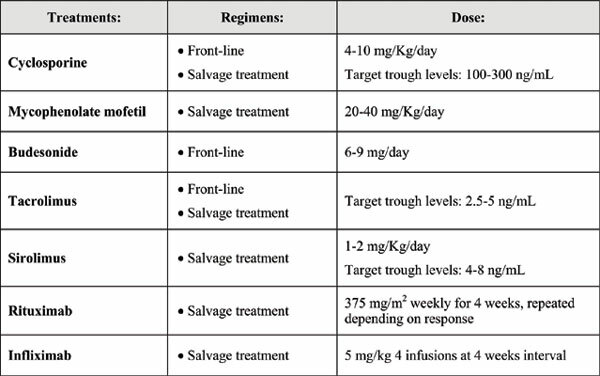 Primary goals of treatment are: normalization of hepatocellular function, extinction of the hepatic necroinflammatory process, and maintenance of a stable remission, thus preventing progression to cirrhosis and its complications. This article aims to review old and new treatments for this rare chronic disorder, from the oldest and most frequently used treatment consisting of the association of prednisone and azathioprine, to alternative medical treatments, liver transplant and promising medical strategies currently under investigation. Result and Conclusion: The review will focus on the efficacy and safety profile of each drug, as well as on the published clinical experience with them in pediatric patients with autoimmune hepatitis. Keywords: AIH, inflammatory disease, immunosuppressive treatment, necroinflammatory process, pediatric patients, multifactorial disease. Keywords:AIH, inflammatory disease, immunosuppressive treatment, necroinflammatory process, pediatric patients, multifactorial disease. Abstract:Background: Autoimmune hepatitis is a rare inflammatory disease of the liver that most frequently affects children and young adults. It is a multifactorial disease of unknown etiology, characteristically progressive in nature, and if left untreated, may lead to cirrhosis and terminal liver failure. It has been known for several decades now that immunosuppressive treatment convincingly alters the outcome of most patients with autoimmune hepatitis and as such it should be started as soon as diagnosis is made. Primary goals of treatment are: normalization of hepatocellular function, extinction of the hepatic necroinflammatory process, and maintenance of a stable remission, thus preventing progression to cirrhosis and its complications. This article aims to review old and new treatments for this rare chronic disorder, from the oldest and most frequently used treatment consisting of the association of prednisone and azathioprine, to alternative medical treatments, liver transplant and promising medical strategies currently under investigation.